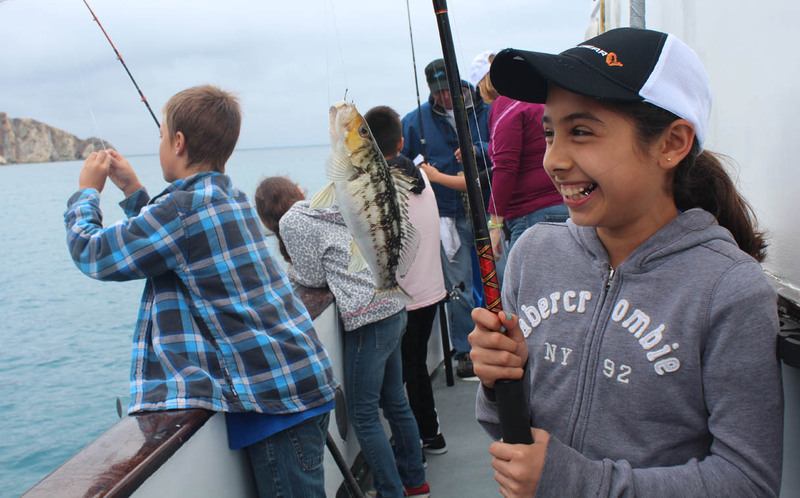 AVALON — The Tuna Club of Santa Catalina Foundation, Phil Friedman Outdoor Youth Program and The Sportfishing Conservancy combined resources to treat youngsters from Avalon School on Catalina Island to a day of fishing in local waters, May 26. The first or two groups of approximately 80 fourth and fifth grade students, joined by teachers and adult volunteers, boarded the sportfisher Toronado when it arrived at Cabrillo Mole in Avalon Harbor. Toronado, out of Pierpoint Landing in Long Beach, anchored over a small reef where the kids dropped their lines. Just minutes after the boat anchored over a small reef, the youngsters onboard began feeling their rod tips dance and rattle under attack from calico bass, blue perch, whitefish and sheephead. The deck came alive with shouts, squeals and giggles, as fish flew over the rails and volunteers jumped in to assist the crew in unhooking, photographing and releasing fish, according to a press release. The event was also supported by Bass Pro Shops of Rancho Cucamonga, Dave Brown of Okuma/Savage Gear, Don Ashley of Pierpoint Landing, Fish and Fame, and Big Fish Bait and Tackle of Seal Beach. Phil Friedman served as Master of Ceremonies and represented his Spanish language radio show Aventuras Al Aire Libre (Outdoor Adventures) and new Hispanic-oriented conservation organization Amigos del Al Aire Libre (Friends of the Outdoors).